Seeing is believing. This is a fundamental tenet that guides us at LinkedIn Marketing Solutions, and it’s why one of our core focuses is providing clear analytics and reporting around all our services. Marketers shouldn’t have to guess how well their campaigns are performing. With LinkedIn Conversion Tracking, a feature available in LinkedIn Campaign Manager, you don’t need to. Using this tool, you can see (and believe) that your efforts are producing the desired results. If they’re not, you can quickly make adjustments to minimize wasted time and spend. If LinkedIn is a part of your marketing strategy and you’re not using LinkedIn Conversion Tracking, it’s time to get on board and take advantage. Here’s why, along with how you can start to implement this tool today. We frequently encourage marketing departments to be more strategic in their approaches. A key component of any strategy is setting goals and continually measuring against them. This is the core function of Conversion Tracking. Whatever the objective of your specific campaign — such as clicks on a landing page or PDF downloads — the tool provides an easy method for assessing your progress toward achieving it. This is especially critical for marketers who must report results to superiors. Conversion Tracking removes the ambiguity and provides concrete data to show that your ads are doing what they were designed to do. You might have Google Analytics or another third-party channel tracking your conversions across media channels. We definitely recommend doing that, but there’s also value in installing our native conversion tracking (and even linking the two, which we'll discuss later). What’s the point? Well, you unlock some powerful optimization and analytics features! 1. 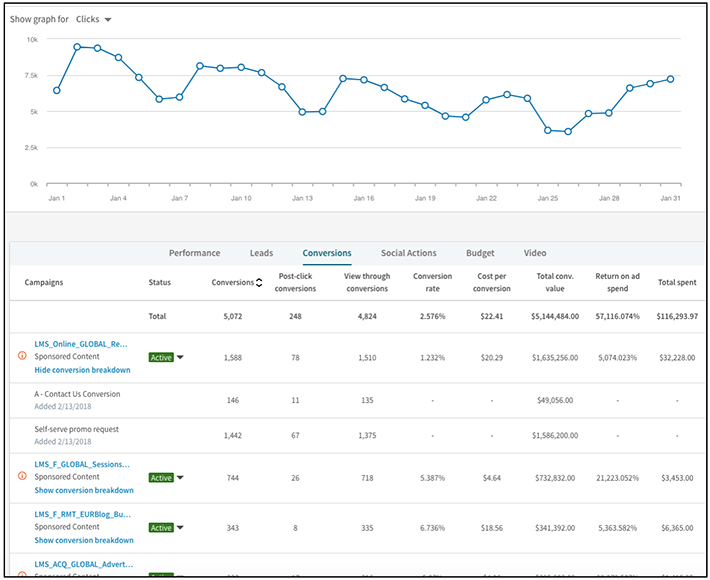 Lower your CPAs automatically with conversion auto-optimization: For Sponsored Content campaigns, marketers can take advantage of LinkedIn’s ad server automatically adjust your bid to prospects who are more likely to convert. Use of this tool can reduce cost-per-acquisition (CPA) up to 13.5%. To activate, use the Bid and Budget tab on your campaigns in LinkedIn Campaign Manager. 2. See what types of people are converting with Campaign Demographics. Ever wonder what type of people are actually converting campaigns? When you install our native conversion tracking, you get access to our free campaign demographics, where you can learn the demographics of LinkedIn members, such as their job title, industries and companies. Check out the “Demographics” tab next to “Time series” on your campaigns. 3. Retarget members who express interest in your business. When you install LinkedIn’s conversion tracking, you get access to a suite of marketing tools, including retargeting. With retargeting, you can create ads to members have already expressed interest in your business. They are much more likely to convert too! What does Conversion Tracking measure, anyway? Well, any number of things. Whenever you’re running an ad on LinkedIn that takes users to a landing page, you can track whether they are taking the desired action once they arrive there. Downloads, installations, sign-ups, purchases, registrations? They’re all quantifiable through Conversion Tracking. Whatever tangible step a user takes to move forward in your funnel as a result of clicking your LinkedIn ad, you can measure it. For obvious reasons, this is far more valuable than simply gauging traffic to a page. Where ROI is concerned, it’s usually not about clicks, but conversions. What’s more: with our native conversion tracking, you can see view-through conversions. Basically, if someone saw your LinkedIn ad and then converted, you can attribute that view! Other tools can’t show you view-through conversions. Soon, Conversion Tracking will become even more valuable, because this month, we added custom conversion window or “look-back” window. Now, marketers can adjust their conversion window for both view-through and click-conversion to 1 day, 7 day or 30 days. Benefit? Marketers can now match their goals and buying cycle. We’ve all got enough on our plates. The idea of setting up any kind of new digital tool or feature can feel stressful and irksome, especially if you’re not a tech whiz. But believe us when we say that setting up LinkedIn Conversion Tracking is very straightforward, and not as technical as you might expect. All you’ll need to do is place an Insight Tag on your website, create a conversion action and plug it into Campaign Manager, then observe your dashboard on a regular cadence. First and foremost, the key is to set up a landing page through your automation platform site, if you haven’t yet. This is pretty simple and straightforward (here’s how to do it on Marketo). From your Marketo account, select your landing page. Scroll to the “Site Header HTML” section and paste in the Insight Tag code snippet. Do not include the <noscript> portion here. In the “Site Footer HTML” section, paste the <noscript> portion of the code. Google Analytics is one of the most popular and powerful platforms on the web for measuring your company’s broader digital impact. Most marketers have a good understanding of how to navigate its many insights and metrics. Without question, Google Analytics is a critical component in any digital marketing toolkit. But to maximize your breadth of measurement and gain a full picture of social media campaign performance, we advise using Google Analytics in addition to – not instead of – LinkedIn Conversion Tracking. The functionality of Google Analytics allows only for measuring post-click events. LinkedIn Conversion Tracking adds another layer of insight by also gauging post-view conversions. This is important because an ad can sometimes lead to a desired action even if the user doesn’t click through it right away. If you’re only looking at one side, you may very well be underestimating the impact of your creative, while missing optimization opportunities. One of the handiest capabilities for advertisers on LinkedIn, auto-optimization, is only available with Conversion Tracking enabled. When activated on Sponsored Content campaigns, this setting will automatically adjust your bid to reach members most likely to convert. This all happens from our advanced predictive behavioral model. This should lead to more conversions and ultimately a decrease in cost-per-action, with minimal effort on your end. During a pilot program last year, campaigns that used auto-optimization saw a 13.5% lower CPA than those that didn’t. Additionally, when you install LinkedIn’s Insight Tag on your site, you not only gain access to Conversion Tracking but also powerful features like Website Retargeting and Website Demographics. Retargeting helps you reach members who visited your site, and website demographics gives you deep insight on what types of people are engaging with your site. These tools enable you to take advantage of the robust professional audience data on LinkedIn that simply cannot be leveraged with Google Analytics alone. For B2B companies, this capability is essential. As slick as Google Analytics is, it does have a tendency to occasionally inflate on some conversions. This often occurs because a Google Analytics uses UTM tags, which fire immediately when the page loads. But think of yourself, sometimes you open a page, but navigate to a new tab quickly. Google Analytics would count this a conversion, despite you even spending time on the page. LinkedIn Conversion Tracking helps solve for this issue because the LinkedIn Insight Tag fires only when the full page loads, so it shows a more accurate count of people actually spending time on your site. With conversion attributions slipping through the cracks, along with accounting for post-view actions in addition to post-click, marketing is able to receive credit for more of the sales it’s helping drive. Google Analytics is a great way to answer “what’s happening” on your website, but it’s hard to understand what’s happening on the individual ad-level, especially on conversions. For example, if you are looking at Creative A, how did that lead to more conversions? What about Creative B? 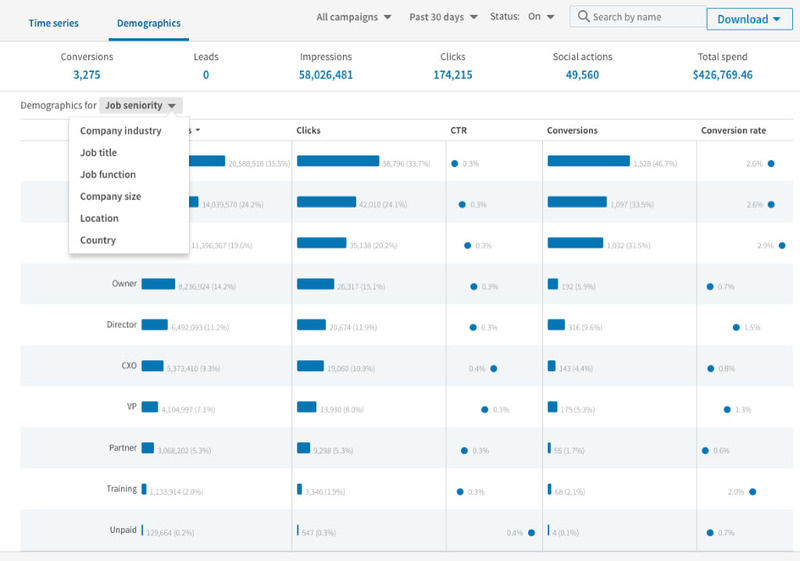 With LinkedIn Conversion Tracking, you can analyze how conversions are impacted on the creative level. And based on what you see, you can make optimization tweaks on a more granular level. To summarize, the rationale for utilizing both Google Analytics and LinkedIn Conversion Tracking is fairly straightforward: use Google Analytics to track broad activity across your campaigns, while use conversion tracking to get access to better insight and optimizations. When Should I Use LinkedIn Lead Gen Forms? For B2B marketers who lean on LinkedIn, Lead Gen Forms and Conversion Tracking are two of the most helpful and powerful features when it comes to generating actionable data and understanding campaign ROI. But which product to use when? The exchange of valued content for contact information is a tried-and-true staple of digital marketing. 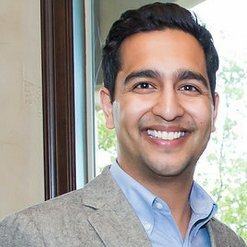 In order to download a whitepaper, register for a webinar, or access some other asset, a user will provide a few details — name, email, job title, etc. — which the company then uses to stay in touch. Lead Gen Forms, which automatically pre-populate based on a LinkedIn member’s profile data, are designed to make this process painless for both parties. Whereas Conversion Tracking helps you measure a wide variety of conversion types such as X/Y, Lead Gen Forms (as the name suggests) have a narrower scope. This is the product you’ll want to incorporate when you’re strictly interested in creating qualified leads to hand over to sales. The output from Lead Gen Forms are comprehensive lead records that can include a person’s name and contact info, company name, seniority, job title, location, and more. Lead Gen Forms also directly connects with Marketing Automation and CRMs like Oracle Eloqua, Marketo, Microsoft Dynamics 365 and Salesforce Sales Cloud. You can also send your leads to marketing automation or CRM of choice through our partners Driftrock and Zapier. Lead Gen Forms are tailored to these particular ad formats. Through Sponsored Content, you can engage members with a catchy call-to-action as they scroll through their feeds. In a matter of seconds, members can click your ad, provide their info, and access your content without needing to leave LinkedIn. Sponsored InMail offers a more direct approach, as you can reach members through the platform’s messaging system. Although Lead Gen Forms can be used for both mobile and desktop audiences, they are especially convenient for smartphone and tablet users. Mobile lead generation has proven a vexing challenge for marketers because nobody wants to type a bunch of info into tiny fields with their phone keyboard. Lead Gen Forms solve this problem with a superior experience for on-the-go users. Setting up Lead Gen Forms takes very little time. Once you’ve logged into Campaign Manager, select “Lead Generation Forms” from the Account Assets tab to create a reusable template. Fill in a few details, select the fields you want to include, add a CTA, then click save. You can then integrate this form into any Sponsored Content or Sponsored InMail campaign. Bada bing, bada boom. When Should I Use Conversion Tracking? Relative to Lead Gen Forms, the Conversion Tracking tool comes with broader utility. It’s designed to give marketers a better grasp of how their LinkedIn campaigns are performing, both on and off the platform. Think of it like the big brother of Lead Gen Forms, where you can track more activity on your website. The beauty of Lead Gen Forms is that a member can interact with them and never leave the platform. But in many cases your campaign will necessitate that a user navigates elsewhere, even if it’s later. 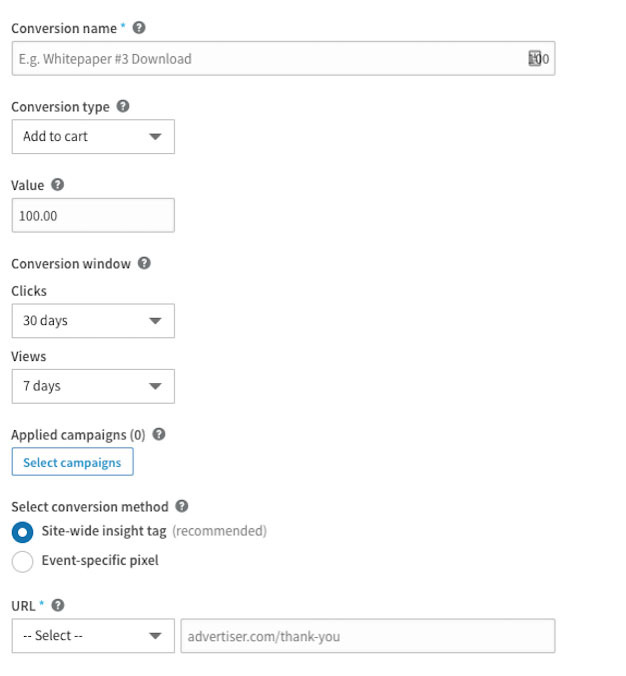 Conversion Tracking can be set up to measure almost any subsequent action tied to your ad — purchases, downloads, sign-ups, etc. Not only can you keep tabs on how many members are converting on your own website after they click your ad, but even after they view your ad, giving you a deeper understanding of the campaign’s impact. Whereas Lead Gen Forms are integrated with Sponsored Content and Sponsored InMail, Conversion Tracking can be used with all types of LinkedIn ads. 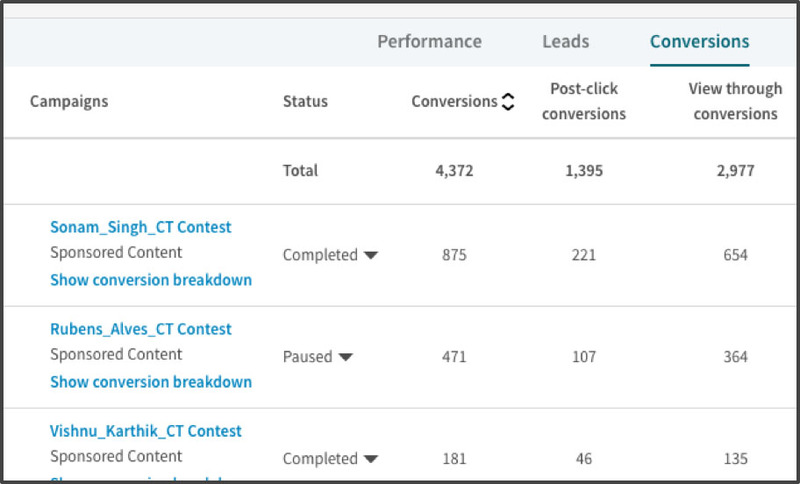 This a universal tool for measuring leads generated by all your advertising on the platform, but it doesn’t actively collect the user data like Lead Gen Forms. Whether desktop or mobile, Conversion Tracking records actions from all users. This data can be used to optimize various aspects of your campaign, be it targeting, content, or a desired conversion type. In order to track user actions after they leave the platform and head to your website, you’ll need to install the LinkedIn Insight Tag, which requires some small tweaking to your site’s code. Don’t worry; it’s easy to do without much technical know-how, and has plenty of long-term value for LinkedIn marketers, who can take advantage of other features like Website Demographics and Website Retargeting once the Insight Tag is in place. You also get access to advanced bidding tools like optimized bidding, which can adjust your bid to lower your conversion costs! The bottom line is this: marketing teams that measure and optimize every possible element of their operations outperform those that are passive and hands-off. LinkedIn Conversion Tracking provides crucial insights to inform and improve any campaign you’re running on the world’s largest professional network. Make sure you’re measuring all your marketing activities. Start tracking conversions on LinkedIn.